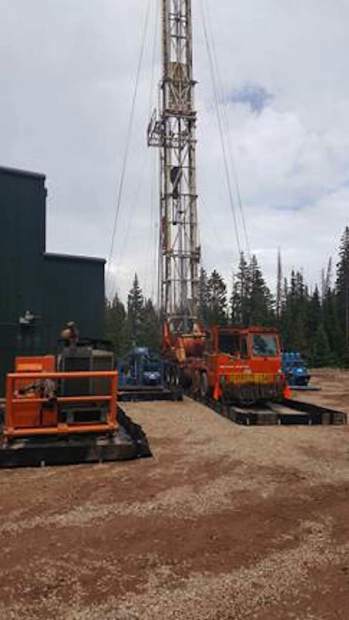 This 2017 file photo shows a workover rig performing maintenance on storage wells at the Wolf Creek Storage Field south of the Four Mile Park area near Glenwood Springs. Black Hills Energy has begun a project to perform general and scheduled maintenance on three storage wells at the Wolf Creek Storage Field south of Four Mile Park in Garfield County. According to a company news release, equipment, including a workover rig, will be brought to the site soon to access the wells. Maintenance activities, including downhole well inspections and maintenance, are expected to last 30 days. The company goes on to state that many of the safety measures that Black Hills Energy installed at Wolf Creek were later adopted as part of the Department of Pipeline & Hazardous Materials Safety Administration (PHMSA) rules to addressing safety at underground storage wells in December 2016. Forest visitors will also notice an increase of truck traffic on Four Mile Road and U.S. Forest Road 300 during the work. The Wolf Creek Storage Field is a depleted gas field that is now used as underground natural gas storage to serve Black Hills Energy customers in the Roaring Fork Valley. Natural gas is injected into the field during the summer and extracted during high demand winter months for use by natural gas customers in the region, the company explained in its release.